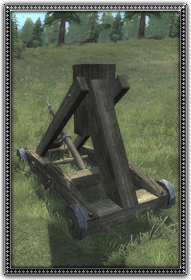 The original Mangonel was first used in roman times to fling large rocks at enemies. This Mangonel, though bearing some resemblance to its forebear, is far larger than its roman counterparts. One other surprising addition is that this Mangonel throws burning barrels of oil! These barrels often explode in mid air, unleashing a torrent of fire down on its poor victims below.